For four hundred years commercial fishing and other forms of ocean commerce have been the central pursuits of Gloucester, Massachusetts. This its “bargain with the sea,” the maritime focus to which the town long held steady. The bargain has been ruinously expensive, costing the lives of thousands of fishermen and devastating countless families. On the plus side of the ledger, Gloucester’s maritime commitment brought prosperity to some when Gloucester was the leading port of America’s North Atlantic coast, and continues to afford many a decent living. There has been another, unlikely dividend. 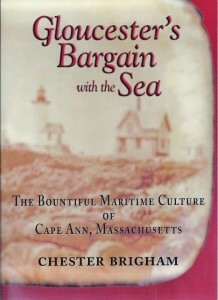 The town’s pact with the sea, endorsed to one extent or another by adjoining towns on Cape Ann – Essex, Rockport and Manchester-by-the-Sea – has infused every aspect of the history, literature, art and way of life of the area, from the innocently revealing journals of Gloucester deep-sea skippers to the efforts of Rudyard Kipling, T.S. Eliot and Charles Olson to come to terms with Cape Ann in fiction and poetry; to the artistic epiphanies experienced by Fitz Henry Lane, Winslow Homer, John Sloan and Edward Hopper when painting Gloucester. Here is a profile of that culture and its people at the edge of, and deeply influenced by, the sea. 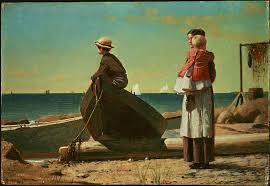 1973, the year Winslow Homer first painted in Gloucester, 174 men of the fishing fleet were lost at sea. In Waiting for Dad, family members scan the horizon, hoping to make out a familiar sail. During the two summers Homer spent painting in and around Gloucester harbor, he concentrated on maritime subjects for the first time. To read an excerpt on Homer’s Gloucester years, click here. 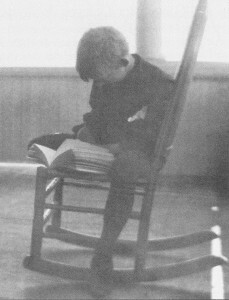 In this photo, a young Tom Eliot is deep in a book on the porch of the family’s summer house in Gloucester. For the influence of Eliot’s youthful summers in Gloucester on his life and poetry, read an excerpt here.